MOBILE, ALABAMA (June 5, 2018) – Outdoor living areas continue to be a popular investment for homeowners, and modern innovations are making it feasible to use them beyond the traditional warm weather months. 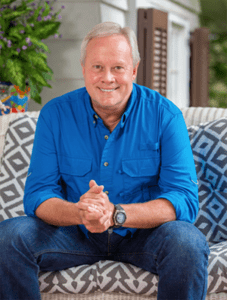 That’s why home improvement expert and host of “Today’s Homeowner,” Danny Lipford, is weighing in with advice for home enthusiasts to get the most out of their new and remodeled outdoor spaces. Lipford launched a national satellite media event on June 5, broadcasting advice to an audience of more than 20 million from a newly renovated outdoor living area in Mobile, AL. Connecting with 22 media outlets across the country, he outlined the basics homeowners should consider when establishing or renovating their backyards. At the top of Lipford’s list is to add a protective covering; he says there are options for every budget. Many homes already have traditional ceiling-covered patios as part of their design, so that’s a good place to start. Incorporating ceiling fans, along with a protective covering, will help keep the space more comfortable during the heat of the summer. Conversely, during cooler months, Lipford recommends using portable heaters and incorporating a fire pit in the outdoor living area. These features increase usability of the space throughout the seasons. Lipford continued his backyard paradise tour with tips for a functional and safe cooking area. “Even though you’re outdoors, homeowners still need to have a plan to move the fumes and smoke that go along with grilling out,” says Lipford. “Adding a vent hood, as you would in a traditional indoor kitchen, is a great option. Lipford introduced viewers to the Elite Range Hood from Broan, which offers a unique and convenient Heat Sentry feature that turns the quiet fan on automatically as needed. In addition, this model offers homeowners under-hood lighting – perfect for evening cookouts – and easy-to-clean filters. To enhance the perfect outdoor living space, Lipford recommends having a portable generator on hand. A portable source of power comes in handy with backyard activities and can provide support for outdoor lighting, fans, sound systems, and even a misting system. In addition, Lipford points out that having a backup power source is the best way to ensure comfort when summer thunderstorms knock out power. He showcased a Dual Fuel Portable Generator, which conveniently runs on either propane or regular gasoline. From Champion Power Equipment, this generator has the capacity to keep some lights going, make coffee and use the radio in the event of an outage. It can also power appliances like a microwave, refrigerator or freezer, but not all at once. To see what type and size generator fits your needs, check out this online assessment tool from Champion. Only operate a portable generator in the open and at a safe distance from your home. Don’t use a generator in an enclosed storage building, garage, carport, basement, crawlspace, or near an open window or door. Never attach a portable generator directly to the wiring in your home. Instead, plug electrical devices into a heavy-duty extension cord that is attached to the generator. Be sure the combined wattage of all the devices that are plugged into the generator does not exceed the rated capacity of either the generator or extension cord. Turn the generator off and allow it to cool before refueling. ﻿The media event was sponsored by Broan and Champion Power Equipment. A broadcast-ready clip with Lipford’s advice is available to the media. Find additional backyard paradise tips and home improvement advice at TodaysHomeowner.com. “Today’s Homeowner” is a trusted home improvement authority delivering fresh, original, practical advice to consumers across diverse media platforms including the top-rated, nationally syndicated “Today’s Homeowner” television show, now in its 20th season and its radio counterpart, the nationally syndicated “Today’s Homeowner” radio show. Additionally, the media brand hosts the top home enthusiast destination website, TodaysHomeowner.com, drawing more than 2 million monthly visitors, robust social media channels and the award-winning lifestyle blog and web series, “Checking In With Chelsea.” 3 Echoes Productions, the professional production arm of the brand, serves an impressive national clientele with expert video services. Host and founder of the brand, Danny Lipford, is among the most sought-after home improvement experts in the country. The seasoned remodeling contractor and media personality served as the home improvement expert for CBS’s “The Early Show” and The Weather Channel for over a decade and has made more than 190 national television appearances on “FOX&Friends,” “Inside Edition,” “Morning Express with Robin Meade,” FOX Business Channel, “Rachael Ray” and more. He travels the country making appearances as a brand ambassador and spokesperson, and contributes expertise to hundreds of popular magazines and online media outlets each year.